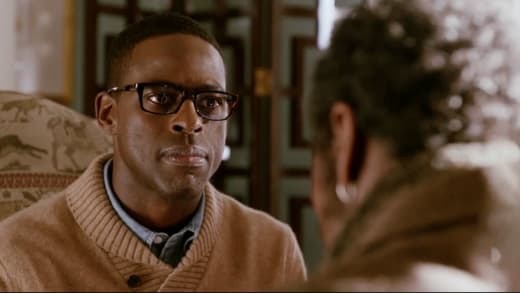 This Is Us Preview: Is This A Hint About Toby's Fate? That's right, TV Fanatics voted This Is Us as our favorite drama. It feels nice to have official representation of what we've already assumed, right? So tell me: did you do your duty over the holidays and initiate at least one person into the family? I did mine and watched all ten episodes again with my (reluctant) aunt, who was afterward unable to stop thinking about events surrounding the Pearsons! What's coming next will undoubtedly be just as compelling as the first half of This Is Us Season 1. With the cliffhanger ending, are we getting an indication in this preview that Toby is going to be OK? After all, he tells Kate he can live without potato chips and cookies, but he can't live without her. He has her again, so he's going to survive his broken heart, right? 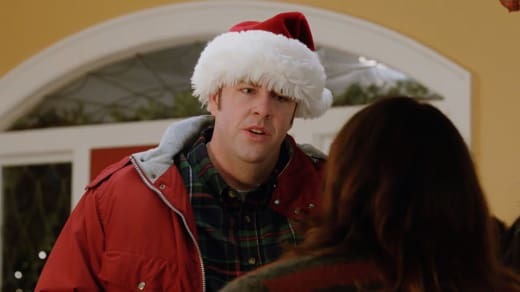 Nobody who was dressed in a Santa hat dies. We're also going to dig a little further into Rebecca's pregnancy when she and Jack learn they're having triplets. We know it was a natural pregnancy, so it will be a fun time in their lives to explore. This isn't a surprise: Olivia's back!! What is rather shocking is her amazing technicolor hairdo. A short blonde bob is not what I'd picture on this Salem witch. With Kevin firmly in the arms of Sloane (and looking happy, to boot), will he be able to resist the call of the wild Olivia? Something tells me that's a resounding no. In the oh-no-we're-gonna-get-our-eyes-wet department, William shares with Randall that his medication has stopped working. Thanks to that flash forward we all saw (and made me very confused for one episode), we know William will pass while living with his son in his granddaughter's bedroom. We've already seen Randall crying. We know it will never be more permanent than it is now. NO. That does not prepare me for anything. William has a lot more sage advice to deliver to a lot more characters. He has not had moments with Kate and Toby yet. Will he get some new medication? May I suggest Interferon and Interleukin? Some of the inters? Well, watch the preview and let me know what you're thinking. What story are you most looking forward to seeing? How badly do you want it to be Tuesday?? NOTE: THE SHOW WILL AIR AT A SPECIAL TIME ON TUESDAY, 10PM. This is to accommodate President Obama's final presidential address.